I received a letter from our school district's Executive Director of Instruction. Here's the opening paragraph. "Your third grade student was given the Ohio Achievement Assessment for Reading last October and April. With both administrations your child's Reading score was below the 'proficient' level identified by the Ohio Department of Education for both test administrations. Therefore your student is being invited to participate in a week-long reading intervention class that will target your child's areas of most weakness and address those in a focused manner." Hmmm. "With both administrations...for both test administrations"? Redundant redundancy. My child's "areas of most weakness"? Most awkward. "[A]ddress those in a focused manner"? Oh, good. I would hate for them to waste his time in an unfocused manner. Methinks Madam Executive Director could use a little English 101 tutoring. While I feel a tad mean-spirited calling her out for "below the 'proficient' level" composition skills, I'm not sure how I feel about Jack's being invited to participate in reading intervention. 1. Jack's OAA reading scores are essentially meaningless. Children with autism often score well below their ability simply because tests are boring and pointless, and the OAA focuses on an extremely artificial curriculum mandated by bureaucrats in the state of Ohio. The reading scores, in particular, are far below Jack's actual ability. Allow me to give an example. Jack scored low in vocabulary acquisition. Third graders in our district do word-of-the-day worksheets and are tested once a week on this vocabulary. The first month of school, I helped him study for these tests, but I very quickly realized this was an utter waste of our time. The artificiality of the vocabulary meant little to Jack, and he couldn't retain the few words he got right on the tests even a week later. For instance, the word drought didn't stick. We did a worksheet together and I asked Jack to use it in a sentence, but he replied, "Uh. Mommy. Maybe later. I'm bored." I made him do it, but he still missed it on the test. Jack actually does a lovely job acquiring new vocabulary in more natural ways.Yesterday, we were outside, and I pointed out the cracks in the dirt and crackling dryness of our grass. I told him we were in a drought, and that meant we weren't getting enough rain to keep the grass alive. He replied, "Wow. The drought makes all the plants thirsty and dries up the mud in the river." He used the word so easily and with the delight of a child learning something powerful and new. I'll make a point of repeating the word a few times this week and invite him to use it. Then he'll have it down. Worksheets only teach--really teach--children who are enthusiastic pleasers. I loved worksheets in school. For that matter, I loved standardized tests. Jack, however, can't understand why a teacher or his mom would be pleased if he did well on a worksheet. Worksheets are, to him, boring. So are tests with bubble forms. What is the point? If a child isn't doing his or her best work on a test, how meaningful are the test scores? 2. Jack's scores in October and April were low (as they have always been). I question whether one week, 12.5 hours, of instruction will have a significant impact on Jack's reading level--either as tested by the OAA or in real life. The letter states that the intervention will target Jack's "areas of most weakness," and such individualized intervention is certainly preferable to a one-size-fits-all program. Our district has some very talented reading specialists although I don't yet know who will be teaching this class. But how will that targeted program carry over into the regular school year? Will his special education teacher get a report of Jack's ability and disability as assessed by the reading specialist? Will his teacher then act on that report in meaningful ways? Will these meaningful ways focus solely on raising test scores or will they encourage and foster life-time reading? You might guess which sort of focus I would prefer. 3. Jack likes to read books of his own choosing. He happily spends hours reading his books, most of which are below his actual reading level for school. But he enjoys them. He begs me to buy them. He saves his allowance to buy them himself. He is also able to read signs, menus (even when he won't eat off of them), road signs, and packaging labels. He remembers reading things several years ago...things most people would forget. He activates closed captioning on movies he watches and studies the words. Sadly, there are no 4th-grade chapter books on Thomas the Tank Engine, although we do have A.A. Milne's Winnie the Pooh books on schedule for reading this summer. As Jack's interests mature, so will his reading. I am not worried at all about the long-term prospects for Jack's reading ability. With nurturing and encouragement and natural development, he'll read just fine, with or without 12.5 hours of intervention. 4. Jack's math scores on the OAA were even lower than his reading scores. A jump-start to his math learning for fourth grade would be helpful because, unlike the reading scores, his math scores actually do reflect a serious disability. Why is there no math intervention program? Of course, I enrolled Jack in the reading intervention class. If the reading specialist is good, the 12.5 hours of additional instruction certainly can't hurt him and may help jump-start his school year in a very positive way. He is happy in the school building and enjoys the school routine. But I will ask lots of questions. And I will be in the school building every week this coming year. Last year, I didn't volunteer much and felt out of the loop. In April, I realized that Jack's reading wasn't progressing as much as I hoped largely because his teachers focused too much on oral fluency. They also weren't pushing him as hard as they could have. Perhaps my being in the building wouldn't have changed what the teachers did last year, but it would have given me a chance to advocate sooner on his behalf. I'll be there this year. Because one way or another, Jack will be a life-time reader. Of that, I am certain. I hope you can read this. Click on the picture to bring up a larger version. 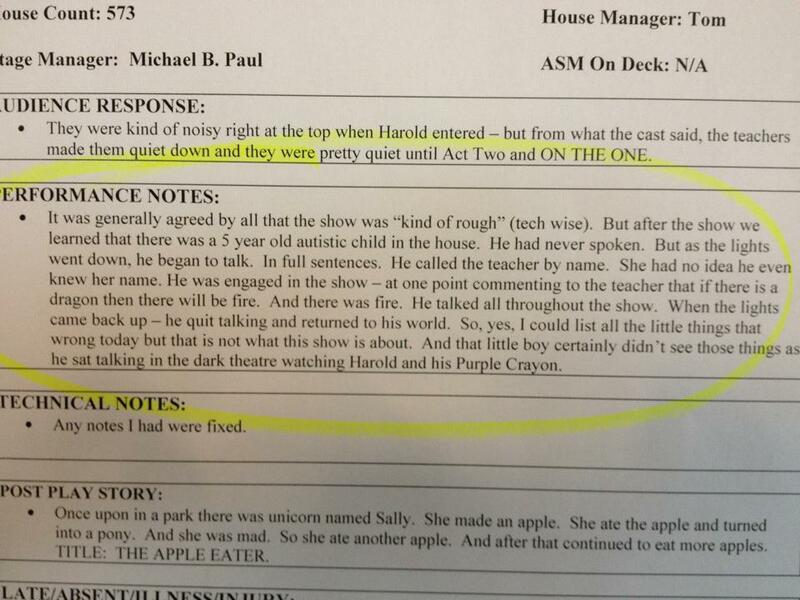 Found this posted on FB and have not been able to verify it, but how completely cool that a performance might elicit this sort of response from a locked-in child? If this is true, I'll bet his parents are wigging out trying to leverage this into some sort of therapy! Today, I gave Jack his first dose of Ritalin. We're going to watch him carefully to see if the dose is right, if any unwanted side effects, if his personality changes. I so pray that this works mainly to help him at school but also to feel more engaged with the world rather than just focused on his stimming. Yesterday was unbelievably stressful. Our appointment with the developmental pediatrician was just 30 minutes (they are usually 1.5-2 hours), and it was presented upon scheduling as a "meet and greet" so the new doctor could get to know his patients. Instead, when Dr. S walked in, he introduced himself to Jack, had Jack introduce me to him, and then said, "Today's visit is mainly to discover if there are any urgent issues you need addressed right now because it's been so long since Jack had access to a pediatrician." Why, yes. We do have an urgent issue. 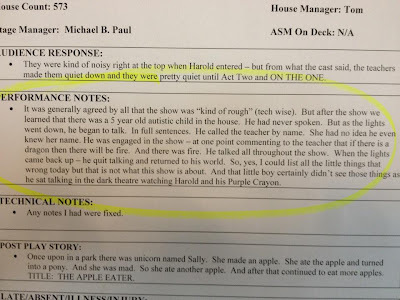 I was so relieved that Dr. Z, Jack's previous doctor, had left detailed notes for Dr. S about Jack's attention issues, which have actually grown much worse since school started in August. I asked all Jack's teachers, aides and school therapists to write summaries of what they see in Jack right now, plus I gave him a copy of Jack's Multi-Factor Evaluation (or whatever they call them these days! ), and Dr. S appreciated the data. He presented himself as an evidence-based doctor and gave me the evidence for attention medication. I already knew most of it because Dr. Z had already told me, but Dr. S's confirmation absolutely put my mind at ease. He also didn't blink when I refused the flu vaccine for Jack and explained that I'd promised Jack he wouldn't get a shot this visit. Jack is completely current on all other vaccines, but he's never had a flu shot. He's not in any of the high-risk categories (other than his age), so I feel fairly comfortable about this. Hopefully, we can get him the mist in a month or so, but I won't subject him to his terror of needles until absolutely necessary. Although it was a brief visit, I was impressed by Dr. S. He seems to have been minted in the same mold as Dr. Z, which is comforting. We'll stay in touch with him via phone as we shake down the medication dose and schedule another appointment in about two months. The plunge is scary, but I so pray that this works to help Jack. Parents of children on the autism spectrum have so many things to deal with that parents of typical children don't really think about, so I generally don't judge them when their decisions don't make sense to me. Just because a particular treatment doesn't seem sensible to me does NOT mean it isn't perfectly sensible to someone else. I applaud parents for taking steps...any steps...to help their children, and as no one really knows diddly sh*t about this disorder, who knows what steps might be the right ones? I sure don't. This year, however, I found myself confronted with a negative judgment on another mommy, one I just can't get over. Nick asked why we couldn't invite one of Jack's friends, let's call him Bill, who had come for a playdate over the winter. Bill's mom had stayed for the playdate because Bill is more severely autistic than Jack, and she and I both wanted her to be here. When Nick proposed a second playdate, I balked. He asked why. I said, out of nowhere I care to examine too closely, that Bill's mom wasn't nice and I didn't want to have to entertain her. Not nice? She was perfectly pleasant and chatty. Whatever made me think she wasn't nice? Then, it came to me. When Jack asked Bill to play with Thomas the Tank Engine toys, Bill said no and ran off to force his company on Nick and Nick's friend. Bill's mom said, somewhat condescendingly, that she decided Bill's obsession with Thomas was too immature, so when he was in first grade, she took all his Thomas toys to GoodWill and refused to let him play with or talk about Thomas so he could develop more age-appropriate interests. When I shared this with Nick, he said, "Why would she do something so mean?" Part of me can understand this mother's desire to make her child more like his peers. But he will never be like his peers. And she knows this. She told me that Bill would never spend much time in inclusion settings at school because his behaviors were too disruptive and she really didn't expect him to ever move to inclusion. He would always be in the autism or LD classrooms, and she accepted this. So why take away his Thomas toys? Perhaps she was sick of them, sick of listening to "Thomas the Tank Engine, Rolling along, Doo Doo Doo Doo...", sick of peeping and sound effects and such. In that, she would have my complete, heartfelt sympathy. But the fact was that Bill wouldn't play with Jack, who wanted to play with him, because Bill was too busy trying to include himself in Nick and his friend's play. Bill wanted to do what the big boys were doing, but the big boys didn't appreciate his pushiness even though they did try to include him. At least for now, Bill doesn't fit in with either group. Jack's interests are not exactly age appropriate, but then, I'm positive I don't want him playing Call of Duty Black Ops (Rated M for Mature Audiences), like some 8-year-olds do. Kids grow up too fast these days, and while I want Jack to have friends his age and interact as well as he can, I can't imagine taking the joy out of his life by denying his pursuit of things he loves. A few weeks ago, I took Jack to see Winnie the Pooh. He didn't want to go with George, Nick, and me to see the last Harry Potter movie, so we had a babysitter come for that. Jack loved Winnie the Pooh. He laughed and cheered and bounced in his seat. He had a smile on his face the whole time. If fact, it's the happiest I've ever seen him in a movie theater. I will take him to ride Thomas the Tank Engine in September when the really useful engine rolls into Lebanon. He looks forward to it all year, and not to take him seems the height of meanness. His 9th birthday is coming up. Once again, all he wants is Thomas stuff. He wants me to decorate his room "like Thomas," because he saw a clip on one of his Thomas videos about a kid's room being decorated with Thomas stuff. That room was, of course, a toddler's room. I have ideas for making the room look less like a cluttered toddler's room and at least a bit more mature. (No Thomas wallpaper border or bed shaped like Thomas, for example!) He's never showed the least interest in what his bedroom looked like. I think this is progress. What do you think about children on the spectrum having juvenile interests? How hard should parents push to encourage more mature interests? Has anyone had success in encouraging those more mature interests? If so, what did you do? What, in fact, are age-appropriate interests for 9-year-olds other than sports, which our children seem to feel are forced labor camps rather than fun? I have read in several places (and heard one NPR piece) about how parents of children on the spectrum report higher stress levels than parents of children with other disabilities, such as Down syndrome. The most likely causes of this are related to the nature of autism itself. First and foremost to my way of thinking, many children with autism are unable to show affection in ways that are satisfying to parents (hugs, kisses, saying "I love you," expressing appreciation for what the parents do, etc.). Lacking the ameliorating effects of this positive social feedback for their job as parents, they are much more likely to feel stress. Frankly, I'm surprised actual research money needed to be spent figuring this one out. In the past, I posted on Questioning my Intelligence that I don't feel excessively stressed by Jack's diagnosis, and part of the reason for that may be lessons learned during my struggle with depression. For me, Jack's diagnosis meant a lot of driving around and sitting in waiting rooms, and coordinating care with therapists and doctors and teachers. But at no point in this journey have I asked God, "Why Jack? Why me? Why our family?" When I read about people's stress on getting the diagnosis and as they continue to care for their child, I absolutely understand the rage, the fear, the self-pity, and the self-loathing. I understand because I felt all those things twenty-five years ago when struggling with depression. Other than the fear, however, none of those feelings have touched me in relation to Jack's diagnosis. The fear is there every day: fear that we're not doing enough, not doing the right things, missing something that might help. There's also the fear of what challenges Jack will face and how cruel the world might be to him as he grows up. But more fundamental to my ability to cope with the stress of having a child with autism is the level of feedback I get from Jack. He's high-functioning, affectionate, loving, deeply appreciative. He's verbal and says he loves me. That makes the hours of waiting in rehab, driving all over creation for appointments, worrying and fretting and thinking and stressing absolutely worth it and much easier to bear. If he didn't have his demonstrative nature, if he couldn't talk or wouldn't hug, I wouldn't find any of this journey as easy as I have. A friend with an adult child on the spectrum was astonished when she witnessed Jack telling me he loved me and giving me a hug. Her son doesn't do that. It breaks my heart for her, but she seems to have made peace with it and appreciates her son for who he is. She glows when she talks about him, and that alone says a lot about her character. How I admire her strength and faith! So here's my question for today. What do you do to cope with the stress? What is your perception of your stress level and to what do you attribute it? This is a huge topic, with far too many variations for a single blog post...or perhaps a whole book. I'm just scratching the surface here, but feel free in your comments to bring up whatever strikes you most about the topic of parental stress and autism. I'll be posting in the future about those sub-topics that I've noticed myself (such as the stress caused by parents who act like you don't love your child if you don't put him/her on the GFCF diet or in ABA), but it would be great to have more suggestions! Jack has been blessed for the past five years with Dr. Zernzach, a developmental pediatrician at Wright-Pat Air Force Base Hospital. Dr. Z diagnosed Jack and has met with him every six months since. He's answered countless questions, worked the system to get Jack the services he needs, and encouraged and cheered Jack on as he has made progress. When we were at the hospital seeing to Jack's foot injury, we saw Dr. Z across the atrium, and Jack said, "Dr. Zernzach is my favorite doctor." So, of course, the Air Force is transferring Jack's favorite doctor to a base in Texas, to an administrative job in which he will not see patients. No one, including Dr. Z, is happy about this. But that's the military for you: take someone who has amazing gift in one job and give him a different job that he doesn't want in a place he doesn't want to live. Yep. That's an awesome way to use taxpayer dollars to build morale and quality medical care. Cynicism is smoke rising from the ashes of burned-out dreams. Of course, I'm melodramatic in my disappointment. I know that Dr. Z will do a great job in whatever position he finds himself. I know that he will continue to advocate for quality patient services because he's a doctor and an officer and a gentleman of integrity. And in a few years, he can retire to private practice and do what he loves: see patients. I wish him all the best and send with him my undying gratitude for all he has done for Jack and for us. We could transfer Jack's care off base to Dayton Children's, but the wait to see a developmental pediatrician there is l-o-n-g. Jack will be seen by Dr. Z's replacement in September, as per his regular schedule. But this also means that we cannot start Jack on attention medication until October (his teachers do not want him starting them at the beginning of the school year as their experience with that has not been good). This delay frustrates me and George, mainly because it took us so long to work up the courage and conviction necessary to give meds a try and now we have to wait. At least we have health care; at least we have access to a major medical center that staffs developmental pediatricians; at least we'll get there eventually with the meds. Trying to look on the bright side, here. But it's hard. After all, this is our son we're talking about. The boys' third-quarter term ended, and the school sent out report cards and IEP progress reports. We also recently received their results from the Iowa standardized testing conducted in our district. It's a good thing I'm somewhat comfortable with ambiguity. Jack's report card was surprisingly good, but second-grade report cards do not feel like data to me. For instance, Jack received an A in social studies, yet I decided early in the year that we would not do social studies homework. The second-grade vocabulary list included executive, judicial, and legislative; I'm not wasting my time or Jack's to study these abstract terms. I learned about government in 7th grade. It was easy to learn at that time because my brain had developed the ability of abstract thought. Neurotypical 2nd graders in Jack's class learned the words but, when questioned about their meaning, did not understand what they had learned. Well, it passes for education in Ohio because it's part of the curriculum mandated by the state. But the reality for Jack is that he is more than a grade level behind in math, and while his reading skills are good, his reading comprehension is hampered by short attention span and impaired ability to communicate understanding of what he reads. Consequently, we focus on math and reading homework. I saw the enormous effort Jack put into reading and understanding a lovely story about Hellen Keller, but because the story doesn't repeat the fact of Keller's blindness and deafness, Jack didn't understand that she could not see or hear...even after reading the story numerous times at home and at school. How, then, could he understand the three branches of government? He hears branch and thinks tree. Last night while we played snuggle-bunnies before bed, George spoke for Jack's stuffed Stitch doll. Jack said, "Stitch doesn't talk, Daddy. He's a stuffed animal." Then, George joked, "What!?! I didn't get a talking alien? The Disney store ripped me off. That was money down the drain!" Jack said, "Don't do that to Stitch!" He thought George was going to flush Stitch down the drain. We tried to explain what George had meant, but I don't think Jack really got it because he kept a death-grip on Stitch until George left the room. Jack earned a B in science. This actually seems more reasonable to me. He loves certain things about nature, so he's willing and able to learn. For instance, he was fascinated with the phases of the moon...because he can see it in the sky, see how it changes each night. It's a real, concrete thing. Jack's grades are the result of a modified curriculum to accommodate his needs and must be affected/inflated by the aides he works with. When he was given the Iowa Achievement test, he had no accommodations other than a teacher at his side to keep him focused. She couldn't help in any other way. The scores, needless to say, were very low. This standardized data isn't useful either because Jack's academic skills are nowhere near as low as the standardized test would indicate. These low scores merely tell us how poor Jack's attention span is and how hard it is to motivate him to do things he does not want to do. In the broader picture, these failed attempts to quantify Jack's academic achievement symbolize the failed attempts of neuroscience to describe exactly what causes autism or what therapies can help any given child. The experts can't even come up with diagnostic criteria that make sense, despite their dedicated attempt in DSM-V.
We parents in the world of autism are essentially forced into a world full of ambiguity, irrelevant data, uncertain courses of action. We make decisions to act, wonder if these decisions are right, fret over uncertain evaluations of our decisions, and try hard not to scream with frustration. I crave data. When I get it, however, it tells me little. And I move on. There's really no other choice. How do you feel about your child's grades and test scores? Do you feel they accurately reflect his/her ability? In the world of autism, we have more questions than answers. For parents, this is particularly frustrating. What really causes autism? Which therapies are worth the money? Which therapies are complete rip-offs? Among conflicting opinions, which direction is best for my child? How do I keep my neurotypical children from feeling neglected or overly responsible for their autistic sibling? While there may not be many concrete answers, I do feel there are ways for each family to navigate these uncharted waters without drowning. You'll not find easy answers or sales pitches on this blog. You won't be told what to do or how to do it. You WILL find a place where ideas are thrown on the table with compassion and thoughtfulness, where reader responses are respectful and respected, where everyone understands that we're all doing the very best we can for our children. All content of the blog Questioning Autism, including the book title In the Middle of Autism, copyright (c) 2009, Susan Raihala.